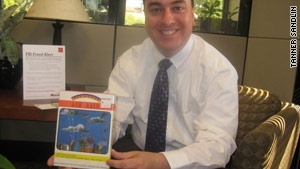 A man who learned that he had one of only thirteen known copies in existence of rare Atari 2600 game Air Raid has won big to the tune of $31,000. What would you do if you read a story on CNN about some of the rarest games in existence, and then realized that you had one of them in your garage? That was what happened to Tanner Sandlin of Austin, TX, whose discovery that he had the thirteenth known copy of rare Atari 2600 game Air Raid made headlines earlier this month. Sandlin's copy of Air Raid was all the more valuable for two reasons: One, he was the original owner of the game, having paid "between $5 and $10" for it in the mid-1980s - all the other copies are in the hands of people who acquired the game from a secondhand source. Two, his copy still had its original box - the only one known to exist anywhere in the world. Last Sunday, Sandlin's Air Raid sold for $31,600, the second-highest price ever paid for any video game - behind the $41,000+ copy of Stadium Events for the NES from earlier this year. Ironically, the only reason Sandlin recalls still having Air Raid wasn't because it was so good, but because it was so awful - when he and his friends used to trade and lend each other games all the time, they always returned Air Raid to him because it was so awful. Of course, he told CNN, he's not complaining now. The eBay auction for Air Raid started at $0.50, made it to $14,600 with five minutes to go, and then sharply spiked to the final price of $31,000 at the last second. Sandlin told CNN that he wasn't sure what he wanted to do with his new windfall, only that he wanted to get something tangible, "something he could point at it and say, 'I bought that with a video game!'"